“The territory no longer precedes the map, nor survives it. Henceforth it is the map that precedes the territory—precession of simulacra—it is the map that engenders the territory and if we were to revive the fable today, it would be the territory whose shreds are slowly rotting across the map. It is the real, and not the map, whose vestiges subsist here and there…” —Jean Baudrillard (1988: 166). Yesterday a student forwarded an image to me that she found on the Internet. At first glance I thought it was simply a mundane, everyday image of of two women playing a video game. Then when I noticed that there was an unused ping pong table in the foreground, the image lent itself to new interpretations. A nice commentary on the way that digital games are changing our relation to analog games—as the digital games get the play, they distance themselves from the neglected real games on which they were modeled. If some digital games are basically playable skeumorphs of the analog—what happens when the analog finally rots away? Is the game in the equipment or in the play? 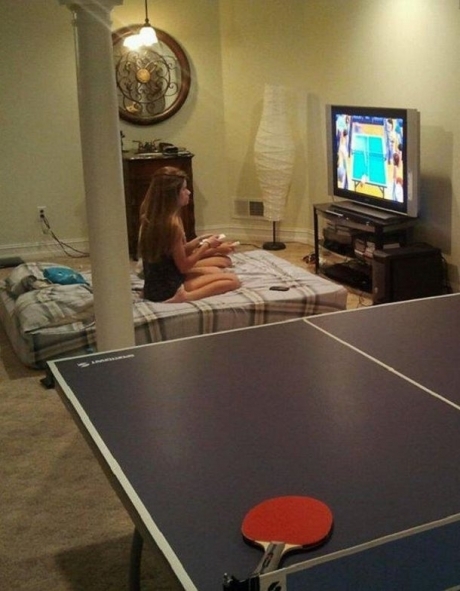 Is ping pong still ping pong when all of the tables are virtually present but physically gone? Sometimes students send along the most interesting things.